Until now, the focus of plastic litter campaigns has been on beaches, with volunteers all over the world lifting bags and bottles from shorelines. 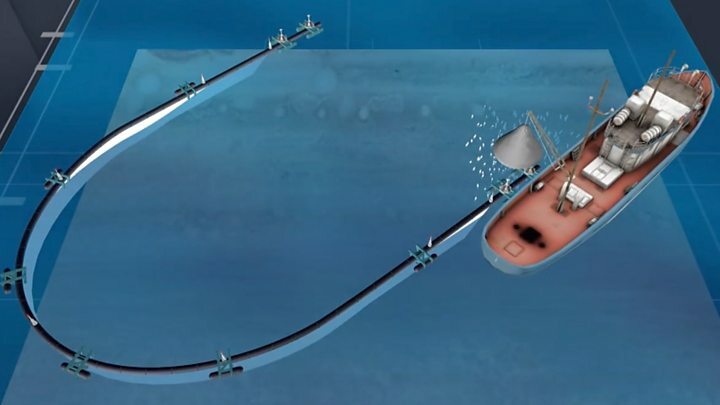 Never before has anyone gone further by trying to clear the stuff from the middle of an ocean and, despite sea trials and computer modelling, no-one knows if the experiment will work. Some experts worry that the effort is a distraction from the more pressing task of stopping more plastic getting into the sea in the first place, and that the operation may cause real harm to marine life. But Boyan and his team at The Ocean Cleanup non-profit believe the sheer scale of plastic out there demands that action be taken. So what they are trying to do? Their target is the eastern Pacific and what's called the Great Garbage Patch, where circular currents have concentrated plastic in one large area. The aim is to halve the amount of pollution in the patch every five years so that by 2040 almost all of it will be gone. "We feel we're in a great hurry," says Lonneke Holierhoek, the project's chief operating officer. I'm meeting her at the project's headquarters in Rotterdam in offices that are far bigger than I expected. The Dutch government is a major backer, along with some wealthy companies and investors. The project, with a budget of at least €20m (£18m), has grown from a young man's vision to a serious international enterprise. There's a faint smell of seaweed and rubbish. On the desks and the floor are boxes brimming with fragments of plastic hauled from the sea on earlier expeditions, a reminder of the task ahead. "If we don't do it," Lonneke tells me, "all this plastic will start breaking down into smaller and smaller pieces - and the smaller the pieces are, the more harmful and the harder to extract from the marine environment." As an engineer who spent the past two decades working on offshore projects, she's not a campaigner but someone with a wealth of experience working with huge structures out at sea. For her, the project is a determined effort to reverse the tide of pollution. "Rather than talking about it or contributing to problems or protesting against it, it's actually trying to solve it." The key point is that the collection system is passive - there are no motors, no machines. Instead, it'll drift, acting like an artificial coastline, gently gathering any plastic in its path. Like a giant snake, made up of sections of tube, it's 600m (2,000ft) long and will float in a giant 'U' shape. Beneath it a screen will hang down 3m (10ft). Because the plastic is floating just at or slightly below the surface, it only drifts with the force of the ocean currents. But because the collection system is also being shifted by the wind and waves, it should travel about one knot faster, shepherding the plastic into a dense mass. Fish should be able to swim underneath and, since the device has smooth surfaces, the hope is that no wildlife will become entangled. On-board cameras will keep watch, and every six weeks or so a ship will travel out to scoop up the concentrated tangle of plastic and take it back to dry land to be recycled. The plan is to use the recovered material to make a range of products to be deliberately marketed as "made from ocean plastic" and sold at a premium price. Some experts I've spoken to are worried that marine life might suffer. Anything drifting in the sea soon gets coated in algae, attracting plankton which draw in small fish and then bigger ones. Industrial fishing fleets actually deploy "fish aggregation devices" to act as lures. Lonneke Holierhoek has an answer. An independent environmental study found that the impact can be minimised, she says, for example by making a noise just before the plastic is lifted out to scare away fish. But Sue Kinsey of the Marine Conservation Society is among those who aren't convinced. She admires the passion and inspiration behind the project but says it could be harmful. "The major problem is those creatures that passively float in the ocean that can't actually move out of the way - once they're in this array, they're going to be trapped there unable to move," she says. She also says it's more cost-effective to clean up beaches instead and focus on preventing more plastic reaching the oceans. Guide: Why is plastic a problem? Prof Richard Lampitt of the UK's National Oceanography Centre also applauds the project for raising awareness but reckons much of the plastic that gets into the sea sinks relatively quickly so that the effort won't be able to make much of a difference. And he also highlights the carbon cost of building 60 of the collection devices, as the plan calls for, and the shuttling of the ships back and forth, all to retrieve an estimated 8,000 tonnes of plastic a year. "The cost/benefit ratio does not look at all attractive," Prof Lampitt tells me. Back in Rotterdam, one of the project's scientists, Laurent Lebreton, is convinced the effort is worth it, and he shows me two examples of plastic waste impacting the natural world. A small piece of white coral has grown around the fibres of an old fishing net - a surprisingly shocking sight. And on the jagged edge of a plastic bottle there are unmistakeable tooth marks left by a fish that's taken a bite. "That plastic gets swallowed and the fish gets eaten and the plastic enters the food chain and ends up on our plates," Laurent says. "The solution is - one - making sure plastic doesn't get into the natural environment, and - two - clean up the legacy plastic that's been accumulating since the 1950s." It'll take three weeks for the system to be towed out to the Great Garbage Patch some 2,000km (1,200 miles) off the coast of California. The first sense of how it's performing should be clear later this year.